at this year’s Ontario Student Classics Conference. This week, the IMACS Blog visits with eIMACS student Shuli Jones. Shuli is one of our star students, having excelled in our university-level computer science courses since the 6th grade. 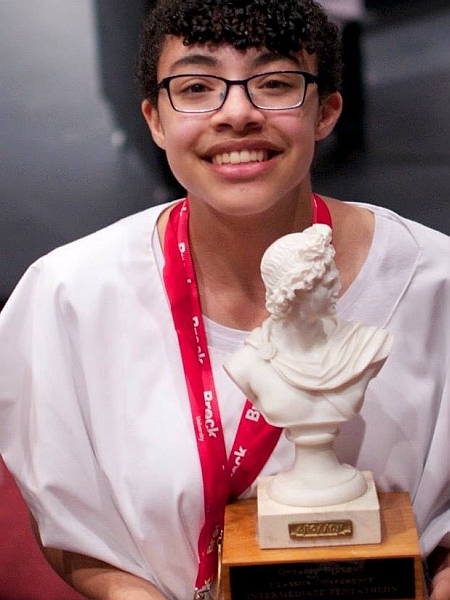 She recently attained the highest score possible on the AP Computer Science A test exam as a high school freshman. A multitalented young lady with a passion for programming, Shuli is well on her way to a bright future. Please tell our readers a little bit about yourself and what you enjoy doing. My name is Shuli Jones. I’m fifteen years old, and I’m currently a sophomore in high school. In my spare time, I like to participate in a variety of activities: I love to read, I do archery recreationally, I’m part of a trivia team and a classics society at my school, and, of course, I love programming. I’m also interested in learning new languages, coding and otherwise! You’ve done some amazing things already at a young age. Tell us about the accomplishments and experiences of which you are most proud. In recent memory, the thing I am the most proud of is scoring a 5 on the AP Computer Science A test. I took it while still a freshman, so it was my first AP test and I was very nervous beforehand. However, eIMACS had prepared me unbelievably well, and that, combined with my own hard studying, meant the test was nowhere near as hard as I expected. When the results came in, both my parents and I were really pleased. Something else I’m proud of is my performance in my school’s classics society. Every year in May, we participate in the Ontario Student Classics Conference. This is a three-day competition with numerous other schools that tests knowledge of Latin grammar and vocabulary, as well as Roman life, mythology, and history. For me, this was my biggest commitment during the school year, and it’s something that I love to do. I put in many, many hours of hard work studying and working on projects with my team members, and it paid off. My team won the Phyllis Morgan Trophy for Overall Excellence, which is typically regarded as the "top" trophy at the conference. I won several individual awards in the Intermediate category (for those having taken two years of Latin): First in Pentathlon, for having the best overall score on the five main events (notably with a first in Latin Derivatives), and first in Latin Oral Reading. I was also part of a group of four students who came second in Quaerite Summa ("Reach for the Top"), which is a quiz-bowl style competition based solely on Roman life. It felt great to get recognition for my work on something I love so much. When I was in sixth grade, I spent Spring Break at a Girls Learning Code camp. 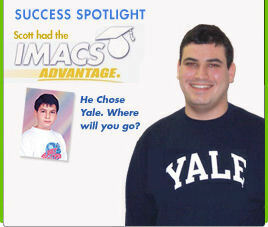 They had partnered with eIMACS to give away a scholarship for the first eIMACS programming course, University Computer Science I. 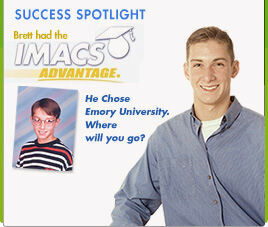 To apply for the scholarship, I took the eIMACS Aptitude Test. The test was interesting and challenging, so my parents said they would sign me up for the course. From there, my interest only increased. I’ve taken three eIMACS courses now, and each one has introduced me to new programming languages, topics, and ideas. What do you enjoy most about the eIMACS computer science courses? I have to say, the thing that appeals to me the most about these courses is their rigor. I can tell a lot of care was put into creating them: the information is always laid out in a logical sequence, and the learning curve is perfect. Assignments are usually just the right difficulty level to leave me challenged but not frustrated. At the same time, the programming that I’m learning is very in-depth; I feel that I’m being prepared very well to succeed in the rest of the coding world. I especially liked the variety of languages that eIMACS introduced me to (Scheme, Haskell, Python and Java), as well as the focus on "good" programming and not just on getting things done. What are some ways in which your eIMACS experience has had a positive effect on your academic and non-academic pursuits? Completely thanks to the knowledge I gained from my eIMACS courses, this past summer I was offered my very first paid programming internship. It was a great opportunity to learn more about the outside world of programming (and the endless debugging that real coders must carry out!). The courses I’ve taken through eIMACS have also greatly increased my capacity for logical analysis and thought; I often find myself applying the programming principles I’ve learned to my schoolwork and assignments. 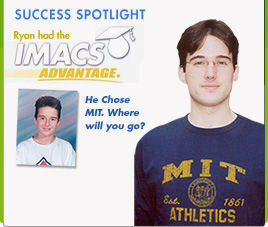 Additionally, eIMACS has had a positive effect on my life overall. I’ve been participating in their courses for three years now, and they have broadened my mind and introduced me to new things I might never have experienced otherwise. I’m so happy that I chose to learn computer science through eIMACS. What kinds of things do you see yourself doing in the future? I’m not sure yet. I know that I want to work in a STEM field, and right now my thinking is that I’d like to do something with engineering — perhaps be a mechanical engineer? I want my job to be something that lets me create new things and leave my mark on the world. Whatever that may be, I know eIMACS has helped to prepare me by giving me a solid grounding in programming and logical thought. 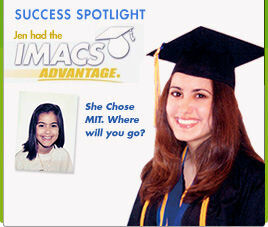 If you want a rigorous online computer science education for your child, IMACS offers high-quality, university-level courses with individual instructor support. Like IMACS on Facebook for the latest information about our local classes and online courses.